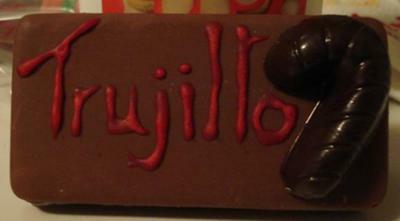 This is the the after picture of the eatable name tags I was making. I showed you the before picture on my first batch of homemade candy page. This chocolate molded name tag is made of mild chocolate and filled with PB mixture (butter, PB and powder sugar), and the name is written with cookie icing! They came out really cute, Madalena! This really is just a fancier version of the very popular chocolate peanut butter balls. It's the same yummy results but with that personal touch that I'm sure your family and friends really enjoyed. I have no doubt that they were impressed. Imagine finding a yummy chocolate name tag at your place setting! I think you will have inspired others to give it a try. Anyone interested can purchase business card molds at Candyland Crafts with either a pre-molded greeting which you can 'paint' the color you like or choose a blank card and personalize it like Madalena has done. Candyland Crafts also has place card molds which are an interesting option, too. I'm wondering how thick your mold is in order to be able to fill it, Madalena? These molds are mostly 1/4 inch thick, which doesn't leave much room for filling. You can get a pour box though which is quite a bit thicker - too thick in my opinion. Anyway, I hope others will be as good as you in sharing their finished products to inspire the rest of us!